An almost complete circle of bright pink nebulas skirts around a spiral galaxy in this NASA/ESA Hubble Space Telescope image of NGC 922. Some 330 million years ago, a galaxy in our cosmic neighborhood scored a bullseye, shooting right through the heart of large neighboring galaxy. 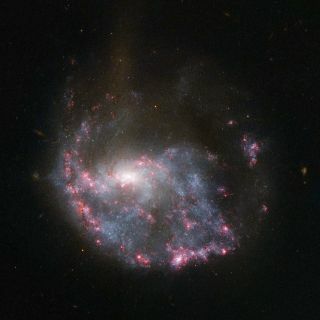 The rare collision restructured the bigger galaxy, NGC 922, giving it the unusual, lopsided ring of hot pink clouds seen in images from the Hubble Space Telescope released today (Dec. 6). Galaxies like NGC 922 are known as collisional ring galaxies, and only a few have been observed near the Milky Way, with the Cartwheel galaxy being perhaps the best known example. While galaxy collisions are not unusual, it's rare for them to line up with the precision needed to form a ring like the one seen in NGC 922. But even this example isn't perfect. The alignment of the galaxies was slightly off center when they crashed, leading to a ring that's not complete and much brighter on one side, Hubble scientists explained in a statement. The color of the nebulas in NGC 922 is also telltale sign of a direct hit. When the smaller galaxy (catalogued as 2MASXI J0224301-244443) blasted through, it disrupted NGC 922's clouds of gas and triggered the formation of new stars. Radiation from these new stars then excited hydrogen gas in the interstellar clouds, producing the bright pink color of the nebulas forming the cosmic ring. Besides being rare, this ring-like phenomenon is also thought to be relatively short-lived, making the chances of seeing one in our local universe quite low. (NGC 922 is 150 million light-years away.) However, observations of the more distant universe suggest that these rings were more common further in the past, according to Hubble officials. The image from the NASA/ESA Hubble Space Telescope combines a series of exposures taken in visible light with Hubble’s Wide Field Camera 3, as well as photos taken in visible and near-infrared light with the Wide Field and Planetary Camera 2. Images from NASA's Chandra X-ray Observatory also revealed ultraluminous X-ray sources dotting NGC 922.